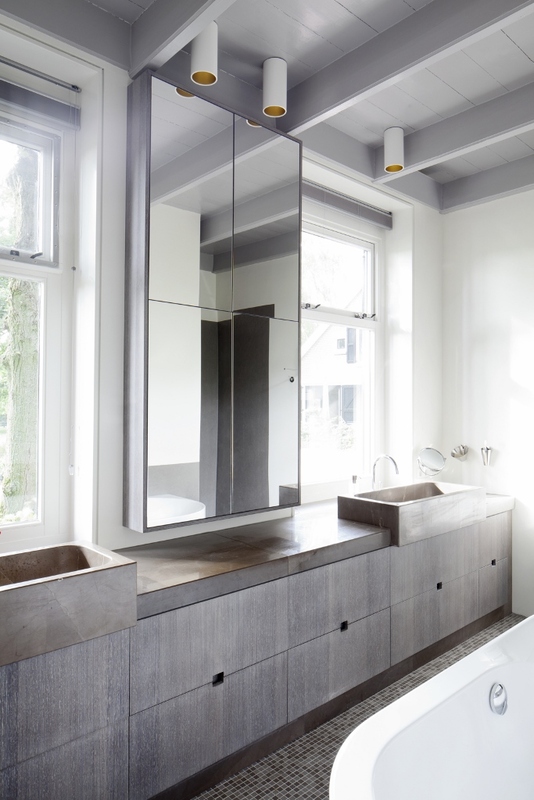 The famous interior architect Remy Meijers has done the renovation and interior decorating for this old farmhouse from 1909, as well as a part of the styling and furniture. Behind the façade original elements go hand in hand with contemporary, rugged materials. A beautiful mix of old and new ensures an interior that is both timeless and modern. Due to the modern interior of this farmhouse in the Green Heart you wouldn’t say that this building is actually over a hundred years old. By connecting the stables and the front-house, ample living space has been created. The applied materials are rugged and natural. 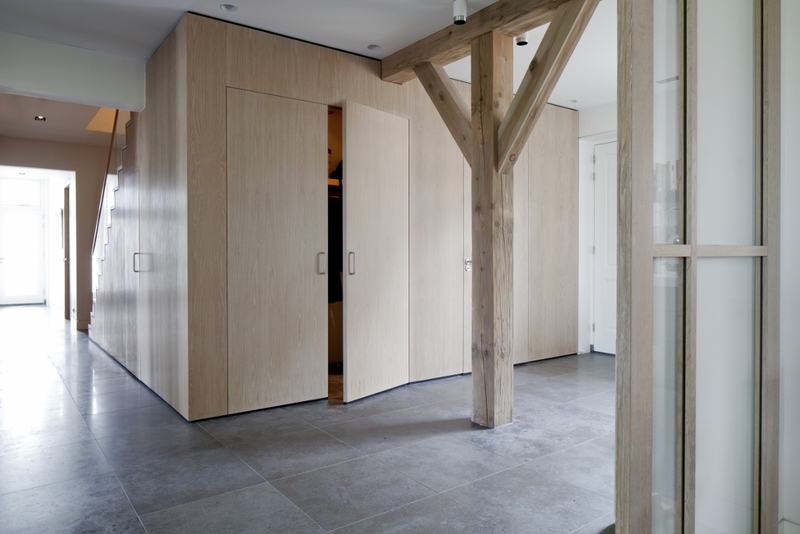 Typical are the sliding doors, which add to the open character of the interior. Over the dining table (design by Remy Meijers) hangs a unique light sculpture by Brand and Van Egmond. The TV is nicely integrated in the dining room’s enclosed cabinet. Beautiful, customized work. 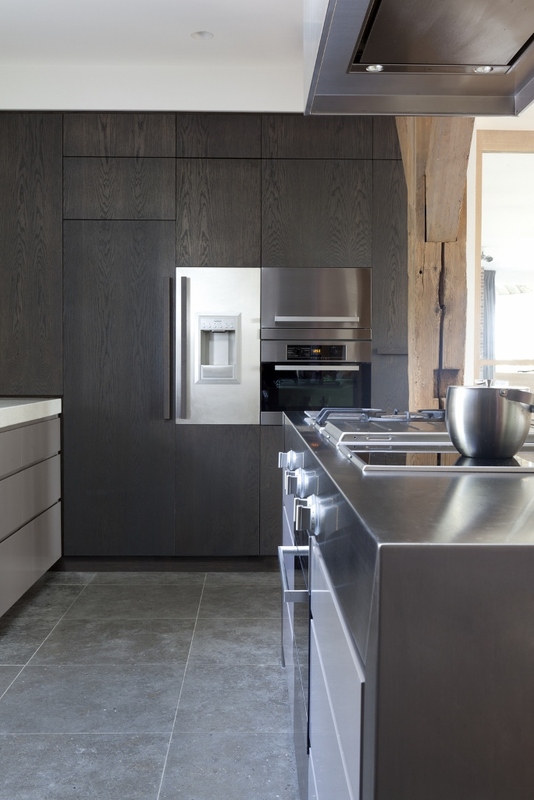 In this open kitchen it’s the mix of materials that determines the ambiance. The countertop is made from terrazzo, the fronts are sprayed in ‘own’ colours and the side cabinets are made of black-oiled oak. The bar is made from oak wood. Shiny stainless steel is also expressly present: in the island, the built-in appliances and some kitchen accessories. In this farmhouse the kitchen, lounge, living-, work-, bath-, and bedroom are found on the ground floor. You experience heaps of space; a luxury in itself. Thanks to the generous amount of windows inside and outside seem to flow into each other. The light lounge is slick and modest in both colour and design, and thus leaves space for other interior elements. The fireplace consists of old bricks with a frame of chiselled hardstone. All throughout the building wooden support beams and pillars are reminiscent of the old days. Like stately beacons in the otherwise light interior. An eye-catcher in the living room is formed by two low, sheet-steel Tamri coffee tables with a sunken bowl (from the Remy Meijers Collection). 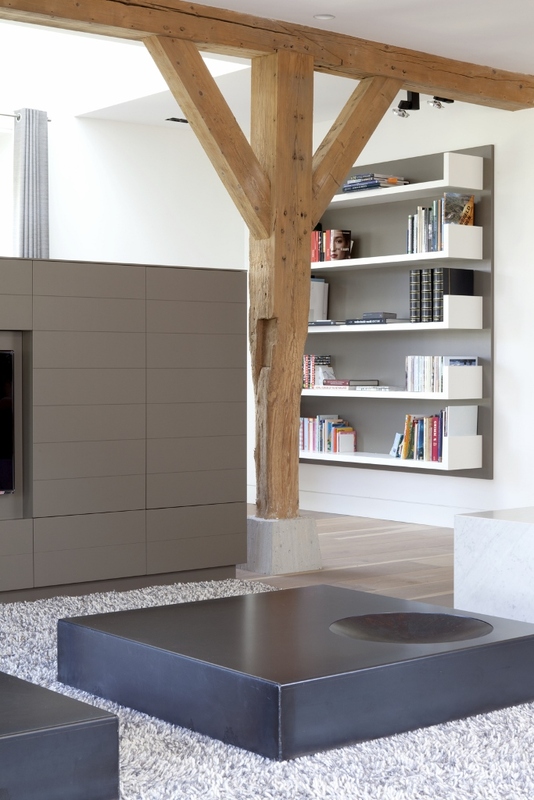 Naturally, the TV-cabinet is a customized design too. Underneath the staircase on the ground floor a spacious storage space can be found. The oak woodwork continues through the hallway and also harbours the wardrobe and a toilet. The stairs to the first floor are made up of oak wood and have a handrail of tempered glass. Several guest rooms and two guest bathrooms are present upstairs. This bathroom has a rugged as well as nostalgic feel to it. The counter and high sinks are finished in natural stone. The fronts are made of wenge wood, oiled in silver. The beam-ceiling is original, the mosaic on the floor is new. Here you will find home accessories from the Remy Meijers collection, or a beautiful floor lamp by Contardi. What do you think of this minimalistic large clock with wooden hands, or these Claudi throw pillows in natural tones?